Anyway, where was I before I was unexpectedly overcome by gastro- outrage? Oh yes. Honfluer, as well as being a favoured destination for artist’s like Monet, is the home of the eccentric composer Erik Satie. 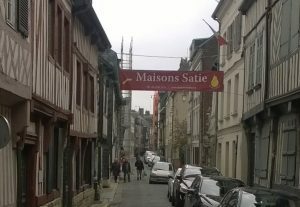 Saties house (now a museum) is among the narrow back streets lined by the half- timbered Venacular houses we were beginning to see everywhere and one of Monet’s muses. On a later visit to Bayeux, the back streets were strikingly similar to the Shambles at York. Tall half-timbered, gabled ended buildings with shops at ground level, leaning over narrow cobbled streets. We had a few favourite destinations, places that became geographical markers stored in the sat nav should we get lost. Saint-Pierre-Sur-Dive was one of these. It’s not a large town, around 4000 residents with a town square, 11th Century market hall and highly rated weekly market as most towns in Normandy do, but it is perhaps the one I will remember the most. Turning onto the road to the town centre, the unmistakable Roman like red roof with chunky spires topping imposing cream stone square towers of the 12th century Benedictine Abbey, rise up among the urban buildings like a magnificent artisan loaf straight from the oven. It was a sight quite enough to feed the spiritually deprived heart of a heathen such as myself to bursting point. 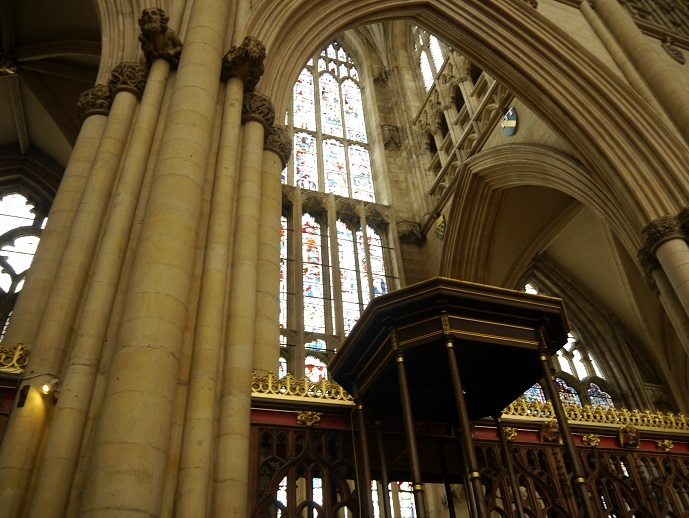 There is no doubting the awe inspiring effect of religious buildings, it is after all the point of them with all those arches, towers and vaulted ceilings pointing in the general direction of redemption. You would have to be a very cold fish not to experience a brief shimmer of religious fervour when you stumble across one, even if you are a heathen. Saint- Pierre- Sur- Dive was also the place I first saw the kind of building that looked like it had been plucked from a once fashionable Parisian suburban street. Illogically thin, the shabby chic detached house was four storeys tall, with attic rooms and elegant, shuttered windows fronted by ornate ironwork with the Benedictine Abbey looming behind and the bland modern Lidl just round the corner. I could never pass it without humming songs from ‘Gigi’. Falaise was another of our sat nav saviours. It’s the ancient seat of the Dukes of Normandy and the home of William the Conqueror, his castle and statue perched on the top of a steep grass bank just off the town centre. Falaise castle holds various medieval themed events in the summer and includes an interactive 3D virtual tour using ipad technology. By holding up the ipad and rotating it round the rooms, sensors project an image of what the original architecture (pre renovation) and decoration looked like. Something for bored kids, the history lover and the IT anorak! Falaise Castle also has an excellent legend of a pig execution that was once the subject of fresco until someone painted over it in 1820. Click on the link to read the full story. ‘Une Latte avec caramel, et une decaffeinated cappuccino sil vous plait’, we asked the bemused girl serving us in the Café Tabac and waving vaguely at the English words on the board on the wall advertising a variety of milk based coffee products. ‘Avec crème pour la the?’ the poor girl asked, trying to be helpful, surely feeling she was on pretty firm ground with the deux caffeine. ‘Non,’ I replied firmly with a self-assured smile. Still, we hysterically chuckled our way through the black tea with caramel and a cappuccino strong enough to blow the top of your head off. We live and learn. 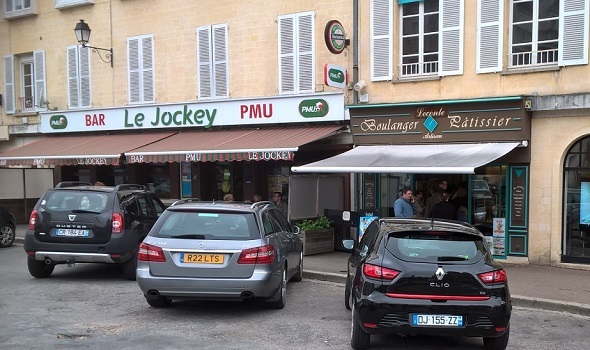 Despite its historical significance, Falaise is not that large and has a population of around 8500. 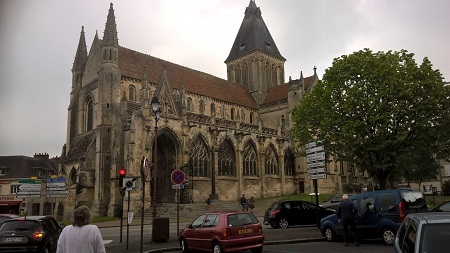 What it does have is the Church of Saint Gervais in the town centre, originally Romanesque it was completed in 1124 and modified in the 13th, 15th and 16th Centuries, including some impressive leering Gothic gargoyles. Medieval Gothic architecture came hot on the heels of Romanesque and went through various stages as the builders became more skilled. In basic terms it started with making the round arches of Romanesque pointed, then followed the French obsession with up building. The thinner walls were divided into up into layers above the arcade of arches and piers sometimes supporting a gallery. The layers above, a ‘blind storey’ of arch window frames with no glass and a layer with windows supported by flying buttresses (think Notre Dame or Canterbury Cathedral). Gargoyles, which are really just drain pipes and are often have no purpose beyond decoration, are there to ward off evil spirits. This is the Gothic adopted and glammed by the Victorians as part of their romantic bent. Though knowing what a Gothic Church meant to your average medieval peasant, you have to seriously question the Victorian view of ‘romantic’.